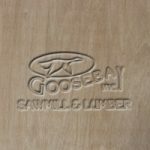 Lauan Plywood - Goosebay Sawmill and Lumber, Inc. This is lauan-veneered plywood. It is suitable for interior cabinetry applications. or for interior sheathing for RV’s or campers. Sheet size is 4 feet by 8 feet. The appearance is rotary-cut (the veneers are cut from the log in a spiral). The core is veneer, which is structurally stronger than an MDF, or particle board, core. For thicker sheets of lower grade plywood, please see the SHOP grade Birch Plywood.